The inside of the burial cave. I have always been fascinated with the past and as a child I daydreamed of becoming a famous explorer and discovering ancient tombs filled with treasures. So when I was invited to go on a trip to visit the ancient cave burials in the Kinabatangan district with some Sabah Museum staff, I jumped at the offer. This was back in 1984 and the road conditions were pretty bad to say the least. It took us a whole day to get to Batu Putih, which was a small village along the Kinabatangan River. Arriving at night, we stayed over with one of the local villagers. We left for the caves after breakfast the next morning and armed with ropes and torchlights, we made our way to the limestone massif known as Agop Batu Tulug which towers 39 M above the forest and houses 4 caves within it. It was hard work trekking through the scrub to get to the lower cave. From here, we scrambled over very sharp limestone rocks and even did some rock climbing to get to the higher caves where the coffins were housed. 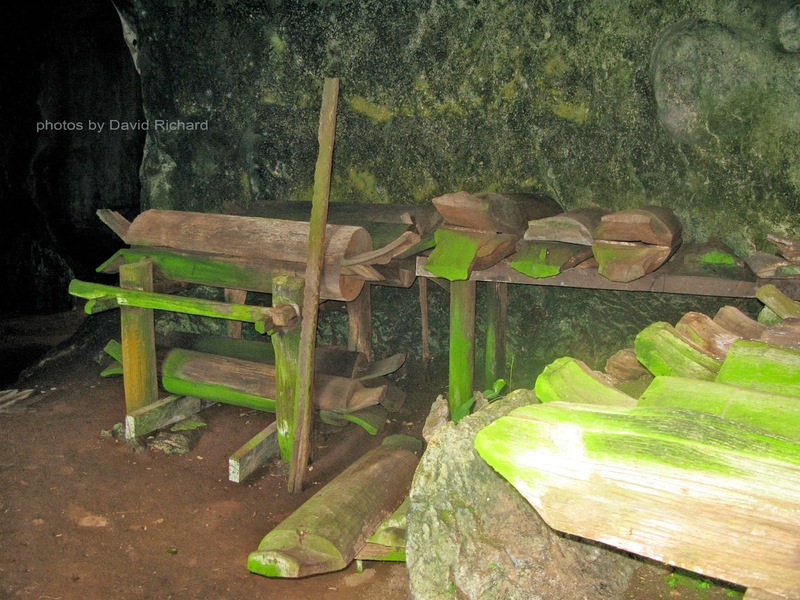 It was a very rewarding sight to see so many wooden coffins stacked one on top of the other while some rested on wooden racks while others were strewn around the cave floor. The coffins were all made of local hard wood such Borneo ironwood (Belian) or Merbau and varied in size, but most average about 2 meters with some smaller ones presumably for children. These coffins are very heavy and some date back to between 700 – 900 years ago. There are 125 timber coffins in this site alone. According to the local people, it would take 5 men to carry an empty coffin and we were left wondering how they managed to get them into the higher caves when we had to use ropes to climb up? 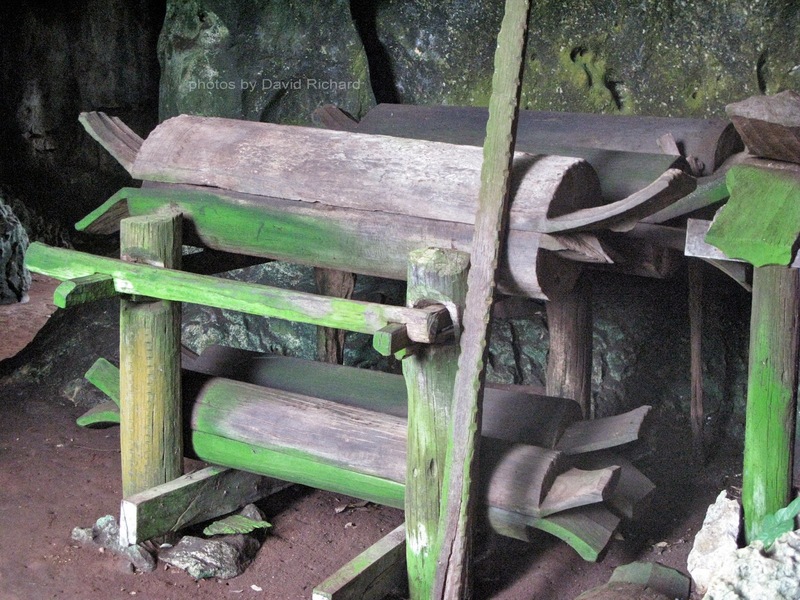 The coffins are made from single logs with the insides hewn out. The two ends are carved with various animal head designs like Tembadau (wild Buffalo), crocodile, lizards, snakes and even birds. There is also a protuberance or “tongue” at the far end of the coffins and if the tongue bears no particular shape, the coffin was made for a women but if it has an animal shape, then it house a man. 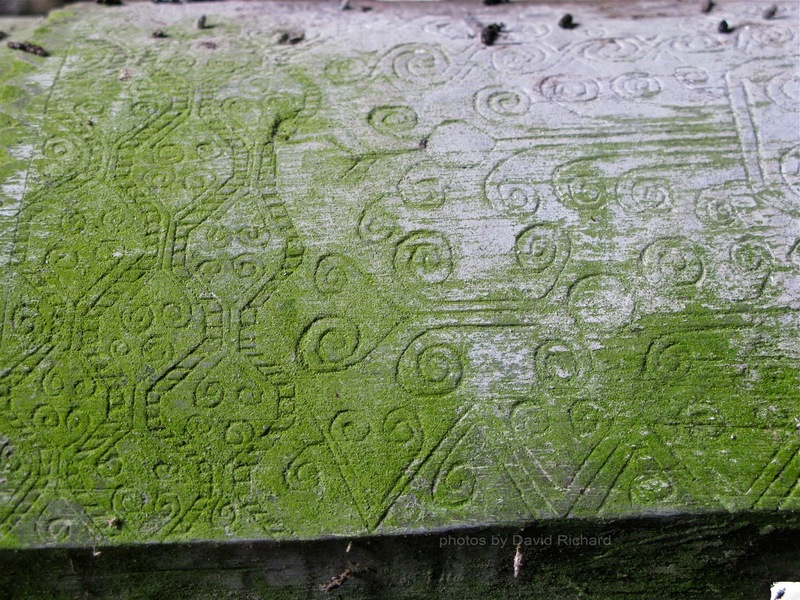 The covers of the coffins are beautifully carved with various traditional designs. There are a number of other caves along the Kinabatangan river which also house similar coffins and apparently some of the natives of Ulu Segama in Lahad Datu still practise this form of burial. We spent some time looking amongst the coffins and noticed that there were remains of human bones, shards of Chinese ceramics (some from the Ming to Ching period) and small glass beads strewn around the cave floor as the dead used to be buried together with their personal belongings. This has now all been nicely tidied up by the Sabah Museum who has turned the caves into a museum in order to preserve this precious part of our local heritage. Staris leading to the caves. 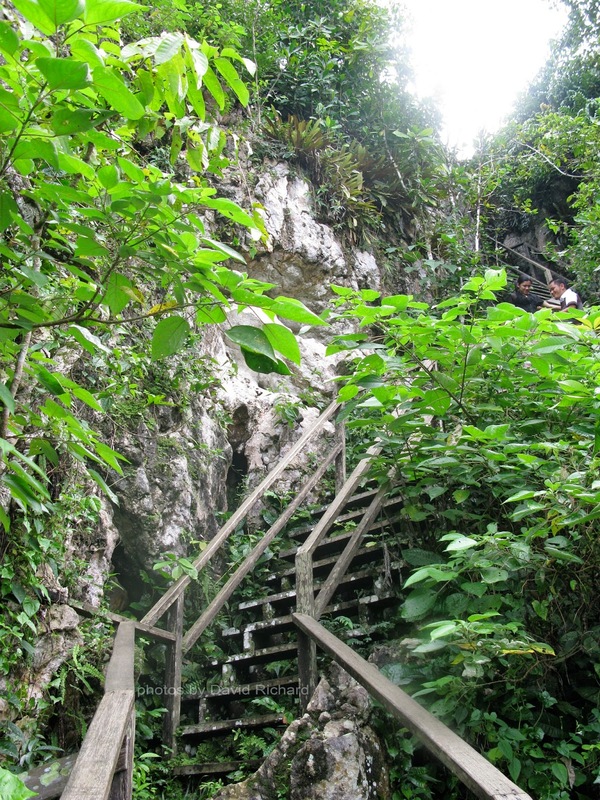 Today, the burial caves are easily reached by road and is about an hour & half drive from Sandakan or 45 minutes from Lahad Datu. The Sabah Museum has built an office, reception, staircases and toilets for the convenience of visitors.